Hay fever usually occurs in the late summer and can last until the first frost. People with hay fever are usually allergic to ragweed, which is a flowering plant from the Ambrosia species. It germinates in the late summer and creates pollen in which many allergy sufferers are allergic. Symptoms can include stuffy nose, itchy eyes, asthma, dizziness and general malaise. There are many ways to control allergies. Some people get allergy shots, take antihistamines, or both. Others use prescribed medications to control their symptoms. One of the best ways to control hay fever is to stay indoors. Purchase an air filter such as a HEPA filter and run it with the windows closed. This takes pollen out of the air that family members drag inside on their closes, hair and shoes. Keep the air conditioner on throughout the remainder of the summer to keep pollen from entering open windows. 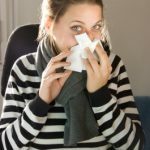 The reason people react to allergies is because their immune symptoms recognize the inhaled substance as a foreign body. The body’s natural reaction is to release histamines to fight off the substance. Instead, the histamine causes inflammation and other symptoms in people who are allergic to hay fever. Therefore, another option of treating hay fever is to take certain herbs and spices that strengthen the immune system. Start taking these herbs a few weeks before the onset of ragweed season. Experiment with the ones that work best for you. Garlic is know for its anti-viral properties. Some cultures even use it as an antiseptic. It also helps boost the immune symptoms. Garlic attracts and removes free radicals in the body. Free radicals are substances that can cause changes in cells such as cancer. Pollen is also a foreign object. Garlic can help the body remove pollen. It can also strengthen a person’s immune system so that ragweed pollen does not cause symptoms. Obviously, those with garlic allergies should not use garlic to help with ragweed allergies. Butterbur is an herb that rivals the allergy and asthma medication called Singulair. It works as a leukotriene inhibitor, according to WebmD.com, blocking certain chemicals that cause swelling in the nasal passages. Take Butterbar supplements and not the raw form. This herb tends to cause sleepiness. Manufacturers and wholesalers of this herb provide safer amounts of Butterbur than eating it raw. Quercetin is an herb found in fruits and wine. It helps block the flow of histamine before symptoms get too severe. Stinging Nettle is an herb people can take after they experience allergy symptoms from ragweed. Its mollifying effects can help sooth inflamed nasal passages or airways. The best way to take stinging nettle is by obtaining substances made from the leaf, not the root. Neutraceutical companies, or those that produce and sell natural remedies, also mix certain herbs for fighting allergies or symptoms. The powerful combination of herbs tend to have a synergistic effect on fighting allergy symptoms. In other words, using herbs together tends to work better than using them separately. Pumpkinseed and safflower extracts are often used together to help boost the immune system. Other herb may include Asian Plantain seed, pfaffia root, slippery elm bark, cassia bark, stevia leaves and Japanese honeysuckle flower extract. Look for companies that sell combinations of herbs for fighting ragweed symptoms. It is also advisable to flush the nose out after spending hours outside exposed to ragweed. Most drug stores carry sinus rinses. Another option is purchasing a bulbous syringe and rinsing the nose out with it. Mix some salt in with lukewarm water. Salt has its own healing properties. It can help reduce inflammation in the nasal passages and sinuses. Flushing the nose also rids the nasal passages of any ragweed pollen that can settle and cause severe symptoms.